The competition has begun! Starting February 1, I’m joining a slew of other money experts in GOBankingRate’s annual Best Money Expert of the year competition. It’s where “the best and brightest in personal finance” go head to head to compete for your vote. Now in its sixth year, I’m amongst some fantastic competition and colleagues. I encourage you to check out all the candidates and cast your vote. No matter who you vote for, you’re sure to learn a few financial tips in the process. 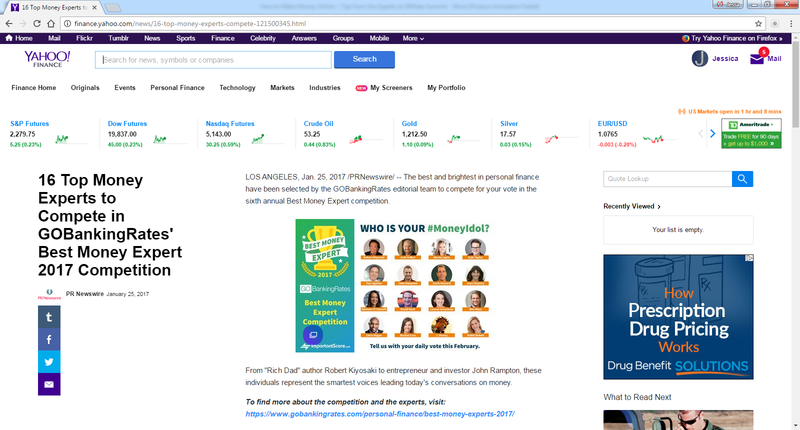 Yahoo’s finance team recently covered the contest, highlighting “Rich Dad” writer Robert Kiyosaki and myself as two of the contenders leading talks around money. The competition is going strong throughout February, and the winner will be announced on GOBankingRate’s website March 7. Also throughout the month, you’ll be treated to a variety of content pieces to help make your decision.